In response to the recent wave of hurricanes pummeling our shores, the U.S. House of Representatives approved a $36.5 billion disaster relief package last week. However, USDA-specific relief funding for Florida agriculture was not included. 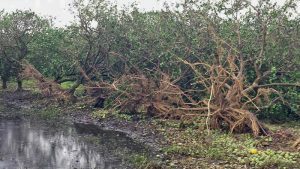 Hurricane Irma was the largest, most powerful hurricane recorded in the Atlantic Ocean, engulfing the entire state and leaving behind $2.5 billion in agricultural damage. Florida’s citrus industry is on its knees, plants remain under water, and shade cloth has been ripped to shreds. Farmers cannot wait any longer! The Senate is expected to take up this package this week, so now is the time for your voices to be heard on this critical need. Call Senators Nelson and Rubio today and urge USDA funding for agricultural disaster relief! Tell them to support Florida’s second largest industry and add USDA disaster relief funding to the package. They need it now more than ever. Don’t wait! Click here to call your Senators and the Administration.